No matter how delicious the main meal is, I invariably crave dessert. I don’t always need something decadent or major, but something sweet to cap off a good meal is mandatory. I know not everyone feels this way (which of course completely baffles me!). This love for dessert may have something to do with the way I grew up: Mom always ended a meal with something of the sweet variety. A lot of times it was a canned fruit from the basement canning room – ok, that sounds way too idyllic – or fresh fruit from the garden; just something sweet to finish the meal. Before you think we were serving up cookies, cakes, pies and the like each night, those were all considered treats and relegated to special occasions. Truth be told, we probably ended up having those more often than not! Over the years, this idea of a post-dinner sweet treat has stayed with me. Most nights after I eat dinner – usually leaning against the kitchen counter – I find myself looking for something else. Maybe just a few grapes, or an apple with vanilla yogurt, or even a few spoonfuls of ice cream. Side note: you may think ice cream would be one of those once-in-a-while treats, but if it’s in the freezer its every night. When friends gather at my farm, I like to keep my Mom’s tradition. If it’s a wintertime sit-down dinner party, I gravitate towards something substantial, like a pie or tart. In the summer, I keep it light with fruits and cookies. And when it comes to the holidays, I love to go decadent. Since I like to think I don’t always indulge, the holidays are THE time for something special. For this year’s Christmas gathering, I stocked the party with platefuls of homemade cookies and candies but needed something extra to finish it all off. 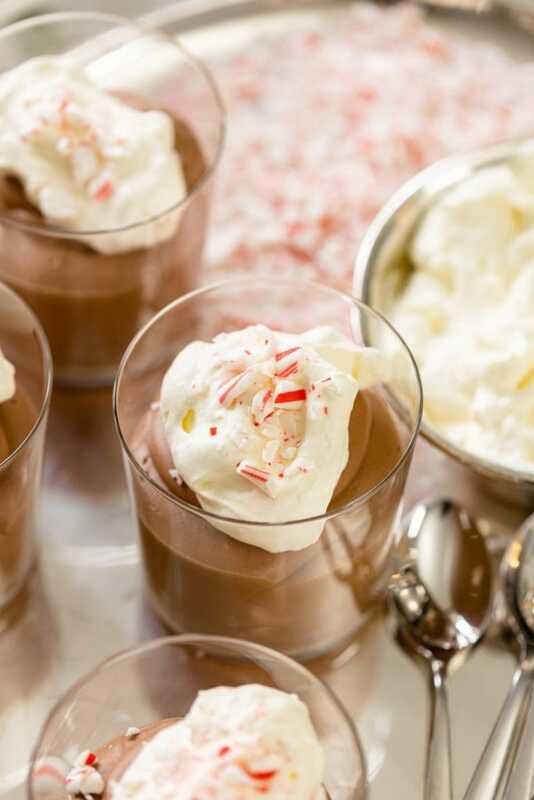 A chocolate mousse is the perfect dessert. The result is light, airy and bursting with deep chocolate flavor. 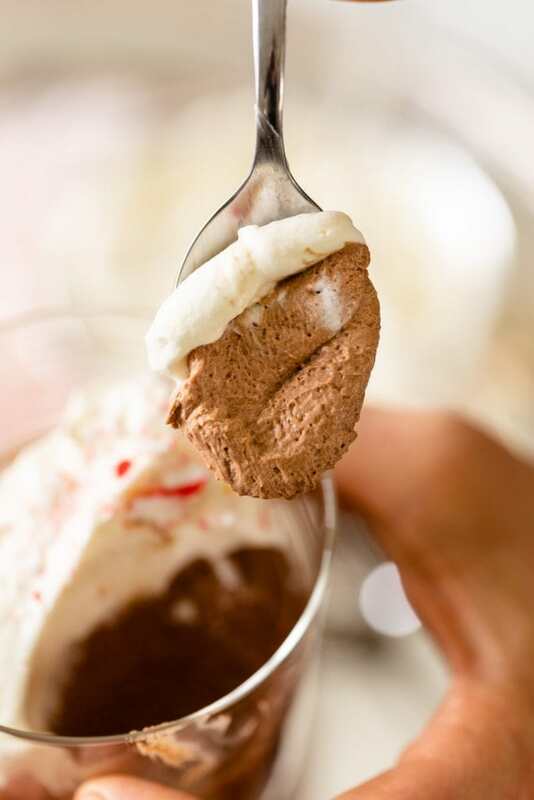 A bit of whipped cream on top balances the intense chocolate flavor and will make your taste buds dance! Seriously… they’ll dance! Chocolate mousse sounds fancier than it needs to be. The word alone seems pretentious, but when you break it down the recipe is very doable. There are a few steps, but as with most of my go-to party recipes, these should be made the day before so they can chill and firm up. Once the egg yolk, sugar and cream base is made, all you have to do is fold in whipped cream and chill. Just like that, you’ll be a mousse master! The texture of this mousse is just. so. good. 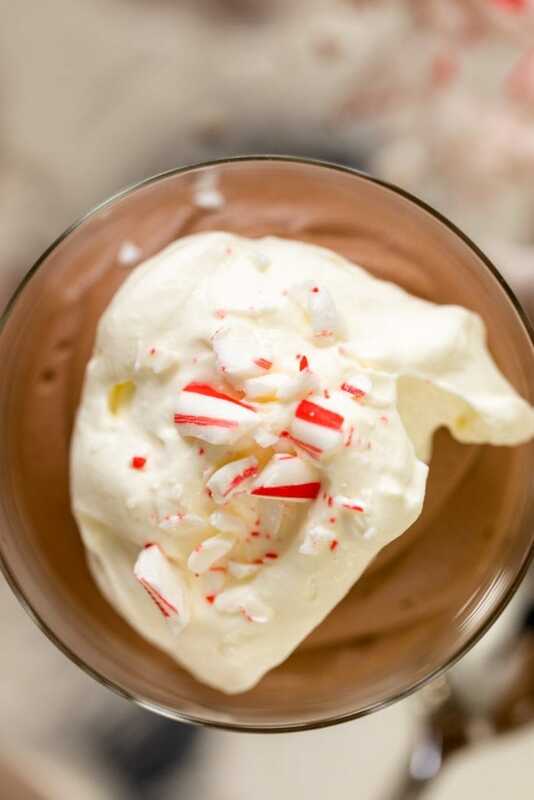 I love to top the whipped cream with some peppermint bits just to amp up the holiday aspect! 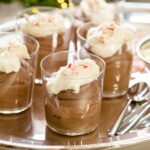 Made from both dark and semi-sweet chocolate, this decadent and EASY chocolate mousse recipe is perfect for Christmas! It’s light, airy and so rich! Break the chocolate into smaller pieces. Place in a heatproof bowl and melt in the microwave 30 seconds at a time, stirring in between until melted. Once melted and smooth, set aside. In a 4-quart heavy bottomed kettle, whisk together the egg yolks, 3/4 cup heavy cream, three tablespoons sugar and salt. Whisk to combine and set over medium-low heat. Continue to whisk over the heat until the sugar has melted and the mixture registers 160 degrees Fahrenheit. Remove from the heat. 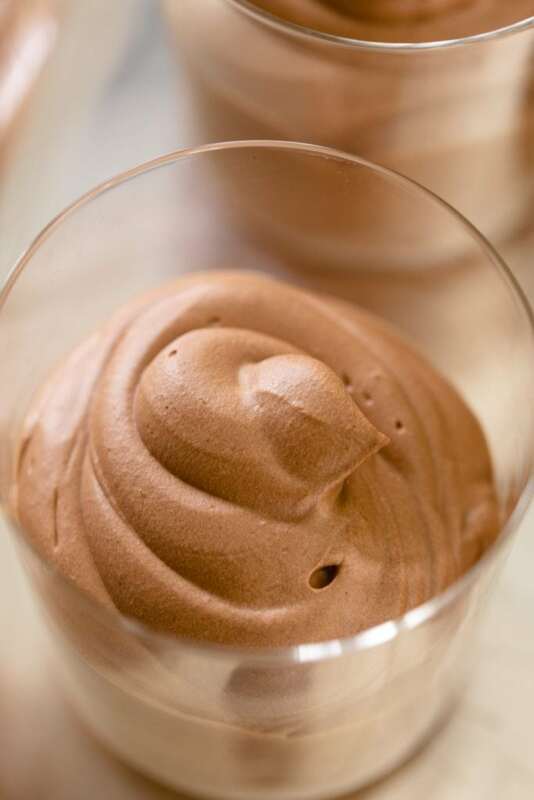 Strain the mousse base through a sieve to remove any lumps or cooked egg. 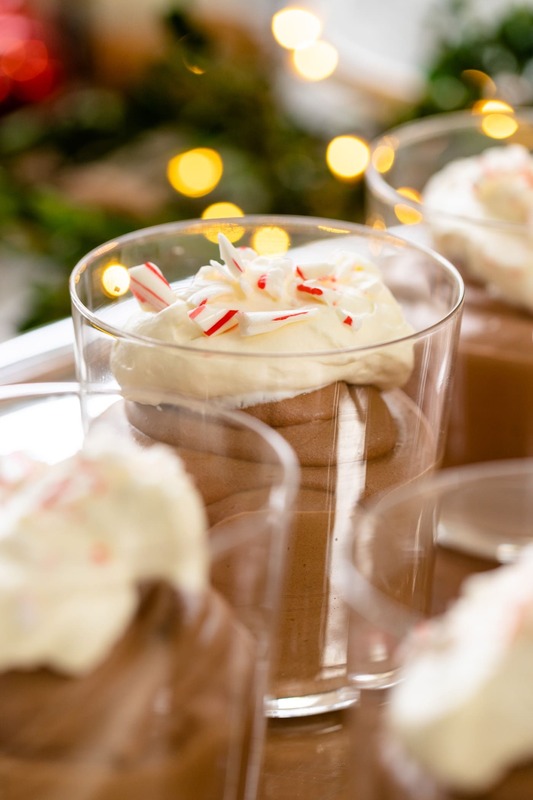 Stir in vanilla extract and fold the mousse base with the melted chocolate until smooth. Set aside to cool to room temperature. Using a mixer, whip the remaining 2 cups heavy cream with two tablespoons sugar to stiff peaks, about 3 minutes. Whisk in about 1/3 of the whipped cream into the chocolate mixture. Once combined, slowly fold in the remaining whipped cream until no streaks of cream are evident. To serve, spoon or pipe into individual serving dishes. This dessert can also be poured into one large dish. Place in the refrigerator and chill for at least 6 hours or up to 48 hours. Once chilled, serve with a dollop of whipped cream!